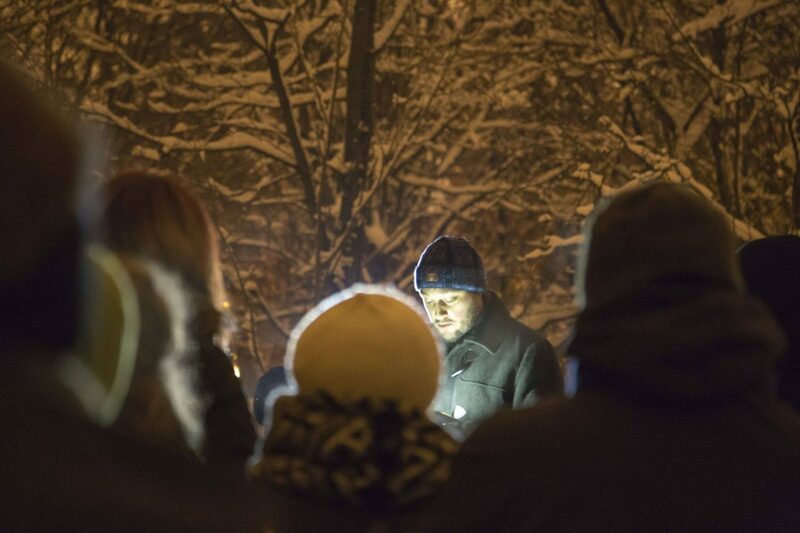 “50 Poems for Snow”, a no-budget poetry festival conceived in Zagreb in the winter of 2012/2013, has spread to take place in a number of European cities, outdoors, on the first day of snowfall. With the beginning of spring, the sixth edition has just recently ended. This was a good excuse to interview Saša Šimpraga – activist, publicist, and one of the founders of the festival – and find out more about this original approach towards creating winter wonderland. Sonja Dragovic: There is something soothing and poetic even in the name of this festival: 50 Poems for Snow. What inspired you to create this event? How did this name come about? Saša Šimpraga: The festival was inspired by a place – a not very well known, even unnamed, public park in downtown Zagreb. As the city is my field of interest, I was thinking what might be added to the place that needs nothing. So poetry seemed perfect, and for it all to be better or less ordinary – snow came about. A friend and a fellow walker, Aleksandar Hut Kono, who is a poet (among many other things) and myself then decided to organize the first festival in the winter of 2012/13 and it needed to be named. We picked a number for no apparent reason and a name in English as we straight away planned that one day it will become international. SD: So, what’s the concept of this festival? 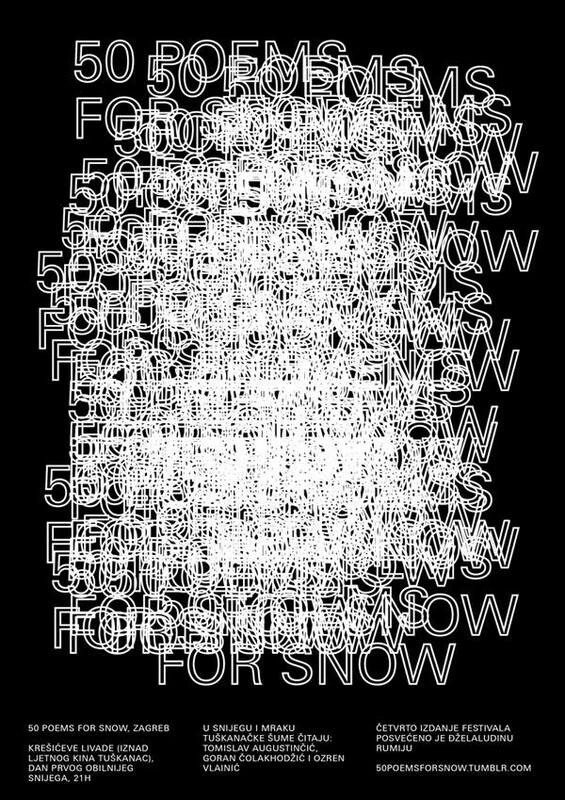 SŠ: “50 Poems for Snow” concept is very simple: it is an international no-budget poetry festival taking place each year in a number of cities on the first day of snowfall. The festival takes place in the outdoors and mostly at night. Three poets perform a few poems of their own, each of them adding one more by a classic author to whom the festival is dedicated that particular winter. I suppose our festival is also the shortest, as it usually lasts some 15 to 20 minutes, which is just right for people to enjoy poetry, atmosphere and snow. SD: In the beginning this was a local story – a little bit of guerrilla action for the lovers of winter and poetry in Zagreb – right? When did it start spreading? 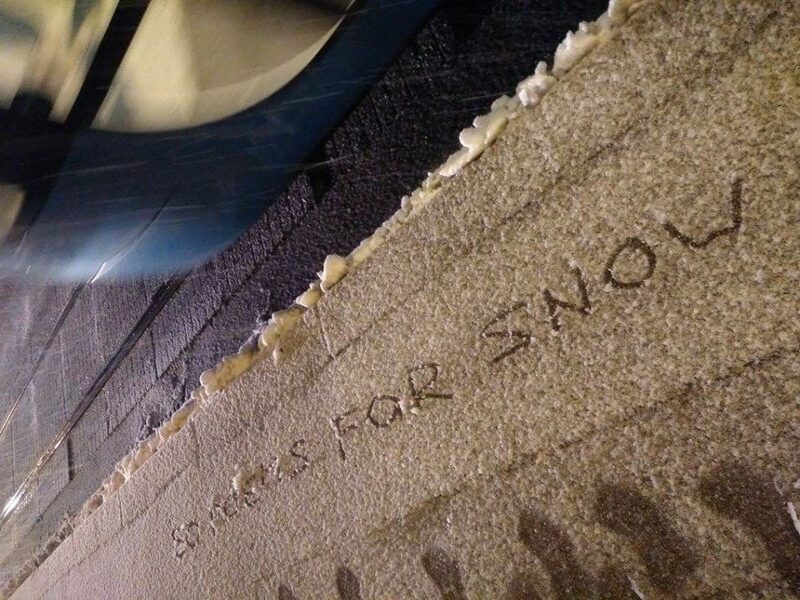 How many cities have been a stage for “50 Poems for Snow” so far? SŠ: It mostly happened through friends and social media. It was in 2015 that the festival happened for the first time outside of Zagreb, and it was the snowfall that decided it’s going to be in Prishtina. Besides Zagreb, winter of 2015 editions also took place in Koprivnica (Croatia) and Colomiers (France). So far, the festival has taken place in 18 cities and 9 countries: Yerevan (Armenia), Helsinki (Finland), Prishtina and Prizren (Kosovo), Belgrade and Novi Sad (Serbia), Vienna (Austria), Sofia (Bulgaria), Colomiers and Toulouse (France), Maribor and Ravne na Koroškem (Slovenia), Čakovec, Zagreb, Koprivnica, Osijek, Sisak, and Sinj (Croatia). A number of other cities also joined our network, and had everything prepared, but snowfall never came. Also, in some of the mentioned places only one edition took place, while in most of them tradition is created and it happens every winter, with different poets. SD: Is it difficult to organize no-budget, snowfall-dependent international poetry festival? SŠ: 50 Poems for Snow is not a registered organization, but rather a hobby to all who participate in organizing it. For most part it is simply fun. We try to have everything ready before winter comes and simply wait for the snowfall. So all individual festival editions are announced well in advance, but the very date when it is going to take place depends on snow and is announced usually less than 24 hours before it happens. Over the years I have noticed that sometimes poets get impatient not knowing when it will take place exactly, but it is part of the charm – and it also demonstrates our dependence on nature and the need for it to be protected in the wake of global warming. Perhaps it is interesting to mention that in Zagreb there’s a clear correlation between the amount of snow and number of people attending. The more snow falls, the more people show up. SD: Every year, the festival honors one world-famous poet. How do you choose who’s it going to be? SŠ: We have an advisory board consisting of three people, Magdalena Došen, Aleksandar Hut Kono, and myself. Having the same poet honored in all the participating cities is something that links all the editions of “50 Poems for Snow”. When selecting names, it is important that translations are widely available, thus it is for the best that globally acclaimed poets are chosen to be honored. Luckily, there are plenty of great poets. We also try to have a poet from a different continent and language every winter. So far, editions were dedicated to Wislawa Szymborska, Tomas Tranströmer, Octavio Paz, Rumi, Constantine Cavafy, and Pablo Neruda. Swedish Nobel Prize laureate Tomas Tranströmer even knew when we had the festival dedicated to him that winter and sent us greetings via his translator in Croatian. SD: The festival also promotes local poets in each city where it’s held. Has this led to forming some new creative “city links”, i.e. 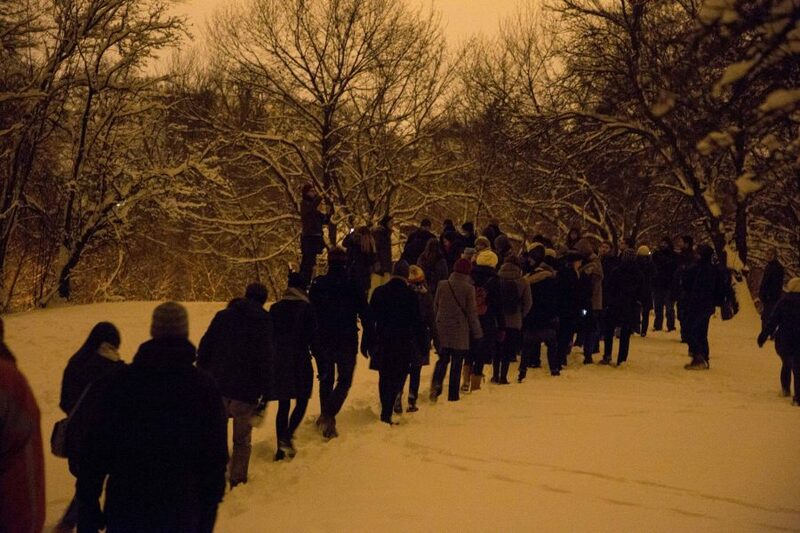 ties and collaborations between authors and activists involved in organizing “50 Poems for Snow” in different cities? SŠ: It is important to know that not only professional poets can join our network. In Zagreb we even try not to invite only the famous ones, but rather find those that are yet to be discovered as great poets or simply write poetry out of love. We were fortunate enough that a number of Goran Prize – the most distinguished poetry prize in Croatia – recipients performed at our editions, alongside totally unknown poets. As for city links, it does not happen as much as we would like to. Local branches function autonomously, selecting their own poets, but network offers a link for them to connect more if they wish to do so. SD: As of last year, the festival started leaving its mark on some pieces of urban furniture in Zagreb – perceptive flâneur will now find metal plaques engraved with verses in unexpected places around the city. Can you tell me more about this initiative? 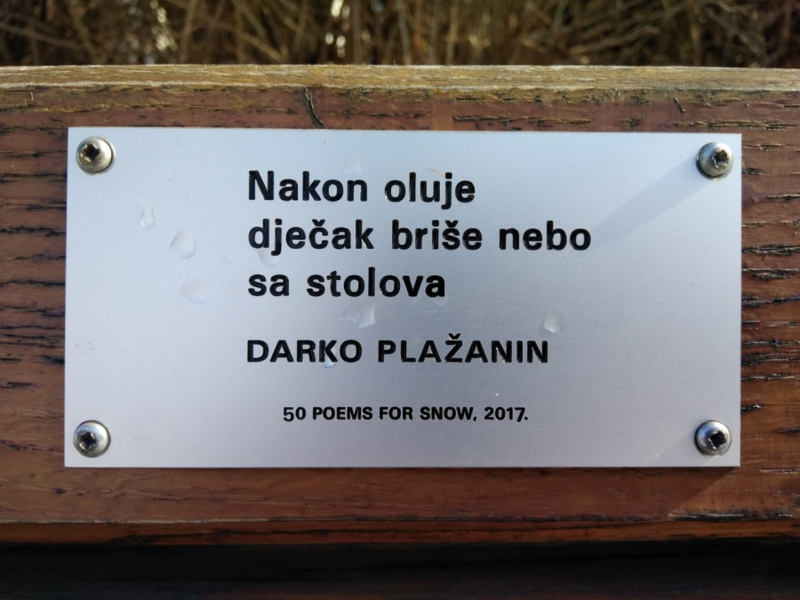 SŠ: In 2017 we have put first three small plaques, one at the public library bearing a verse by Aleksandar Hut Kono stating Dust only proves objects are breeding, and other two containing poems that were put on benches in public parks. 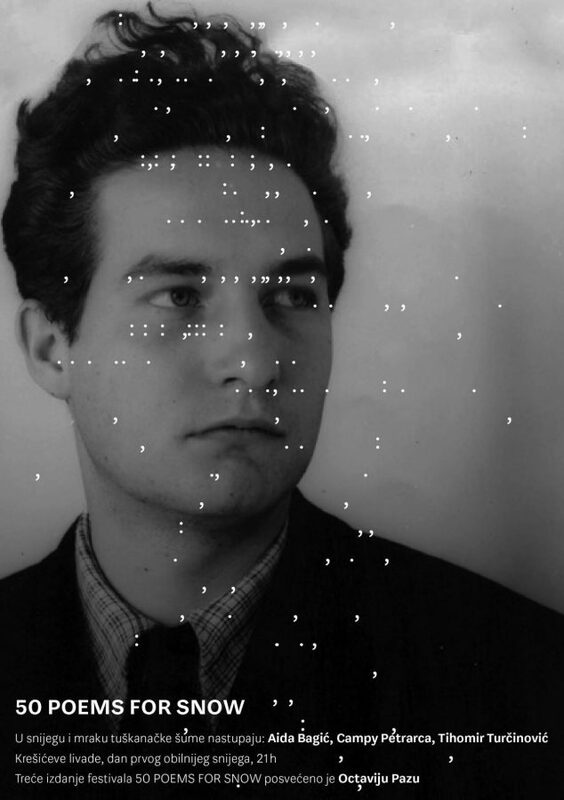 This way, poetry becomes an integral part of everyday city experience. It is a small gesture that might inspire, or make somebody’s day better. Here also we try to have diversity by having one plaque by a world famous poet, one by a famous Croatian poet, and one by a young poet. SD: Have you already started preparing next winter’s festival? In case somebody wants to get involved, what should they do? Are there any geographical, or other, restrictions? SŠ: As everything should be ready before first snowfall – and we do not know when it will come – preparations for the upcoming winter editions usually start just after summer, although I try to develop contacts throughout the year, so anyone interested may contact me at any time. It is easy to organize the event, and it can be done by poets themselves or someone who is not a poet, like myself. In some cities we have organizations do it. There is one question everybody asks out front: do poems at “50 Poems for Snow” need to be about snow? The answer is no. But, there is only one main precondition to host the event and that is that one lives in an area where there is possibility of snowfall in the winter time. There are FAQ on our blog for all those interested. As we are, so far, a European event, I am particularly interested in finding partners on other continents for this to it become a global movement. SD: Finally – what is your favorite “Poem for Snow”? SŠ: I am very sorry that one of the “50 Poems for Snow” editions was not dedicated to Chilean poet Nicanor Parra while he was still alive, him passing away this winter at the age of 103. To answer your question, it is impossible for me to pick a favorite poem, but there is one to serve as an answer to your question: Chronos by Parra, that reminds me that the time is always now. Several eternities in a day. You yawn – you yawn again. And the years have wings.